Caring for our congregation and others is a genuine and authentic sign of putting hands and feet to the love of Jesus. Putting faith into action is a powerful way to let people know we care about them and they are not alone. Through CareGivers we provide meals and other services for those in our congregation who are sick, hospitalized or have a need for assistance in a crisis. 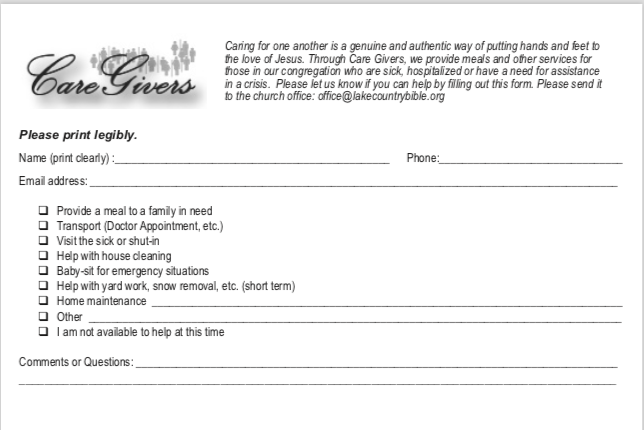 If you would like to serve as a CareGiver, download the volunteer form below or pick up one at the Welcome Center.